Tickets 20 Euro available from The Model at 071 9141405. Parma is not only renowned for its exquisite gastronomie and products like parmigiano reggiano, prosciutto di Parma and anolini in brodo but as an extremely sophisticated city, home to a rich musical tradition, the tradition that stems from Verdi and Toscanini! competitions of Melbourne, ARD Munich and Lyon. 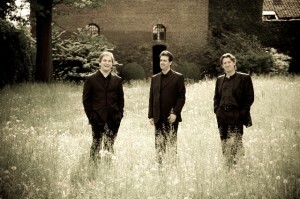 In 1994, they were awarded the Abbiati Prize by the Italian National Association of Music Critics. The Trio di Parma has been a guest of many important musical institutions both at home in Italy and in other countries (Philarmonie in Berlin, Carnegie Hall and Lincoln Centre in New York, Wigmore Hall in London, Konzerthaus in Vienna, St Petersburg Philarmonic etc). The trio also performed in, Teatro Coliseo in Buenos Ayres as well as in Dublin, Los Angeles, Hamburg, Washington DC, Adelaide, Rio De Janeiro and Sao Paulo. The programme comprises two works by two great romantic composers: Schumann and Schubert. Schumann composed three trios for violin, cello and piano: The first of these, in D minor, is generally regarded as the strongest work of the three. gigantic masterpiece that, with Beethoven?s Archduke, could be considered among the greatest piano trios in the traditional repertory. It is colossal in length and breadth, wealthy in thematic ideas, with constant transformations and ingenious details of construction. A typical performance runs to nearly forty-five minutes. Like much of Schubert?s “late” music, it is grand and profound in a way that goes well beyond the relatively modest context in which he wrote. UNMISSABLE!